Welcome to Karl & DiMarco South! Please complete the following registration form. K&D will cancel classes when the school board chooses to close due to inclement weather. Parents are responsible for siblings or other children in their care while in the studio lobby. K&D staff is not responsible for the care or discipline of children that are not registered students and/or visitors. Parents are responsible for monitoring children under their care at all times while in the building. The school is hereby granted permission to take photographs and videos of the students to use in brochures, web sites, posters, advertisements and other promotional and educational materials. Please do not leave any children unattended in the studio or lobby area. No running or screaming in the lobby or studios. All students must follow the K&D south dress code policy. There will be no food or gum permitted inside the studios. Food must be kept in the lobby only. Classes with less than five students may be canceled, combined, or rescheduled at K&D south's discretion. Changes to your child's schedule can be made up until November 1st. You have until February 1st to participate in the recital. (Providing that the costume for that dance is available). No refunds or prorated tuition are given for missed classes. (Holidays/Spring Breaks that differ from our studio's Spring Break, sports games, etc. do not qualify for makeup classes). 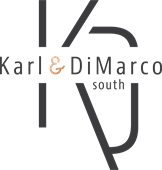 Karl & DiMarco South accepts payments by credit card (Visa, MasterCard, American Express, Discover), cash and check. We now offer an automatic debit through our studio management software, Jackrabbit. Punch cards are for adult dance and students who travel. You can purchase a dance card for $150.00 and receive 10 dance classes of your choice. No refunds! A non-refundable fee of $35 per student is required yearly at the time of registration. $60 max/family. Tuition is divided into 10 equal installments. Tuition must be paid by one of the payment methods offered by K&D South. Tuition will be debited from your bank account on the 1st day of each month from Sept-May or charged to your credit card the 1st day of each month. All charges will appear on your bank statement or credit card statement as being from Karl & DiMarco south. All Tuition, registration fees, recital fees, costume fees, competition fees, recital tickets, and all fees associated with dance are non-refundable. To help defray the cost of recital expenses such as the theater rental, technicians, special effects, props, sets, etc, a non-refundable recital fee of $65 ($100/family) is due and will be deducted from your account October 15th. All families are require to purchase a minimum of 5 tickets for the recital. Costumes: Costume fee will be due on November 1st. Please notify K&D south if your child will be allowed to leave the studio with anyone other than a parent/guardian. Campers should wear comfortable dance or athletic wear. Dance shoes are great, but not required. Tuition must be paid by cash, credit card or check. The tuition is non-refundable. If a payment is rejected due to insufficient funds there will be a $20.00 NSF charge that will automatically be charged. We want your kids to have a great summer at K&D south, so we plan well in advance for crafts, games and activities to make sure we can accommodate all of our campers. With this in mind our cancelation and refund policy is as follows: No withdrawals/refunds will be accepted after May 1. The school reserves the right to provide a substitute teacher if the regularly scheduled teacher is ill or otherwise unable to teach classes. Parents, legal guardians of minor students and adult students waive the right to any legal action for any injury sustained on school property resulting from normal dance activity or any other activity conducted by the students before, during or after class time. The school is hereby granted permission to take photographs of the students to use in brochures, websites, posters, advertisements, and other promotional materials the school creates. Private lessons must be canceled 24 hours prior to the lesson. Lessons that are missed or canceled within 24 hours will be charged the full fee.